Levis is looking forward to the new sbX BRT (Bus Rapid Transit) service which is scheduled to begin in early 2014. It will cut his travel time in half, and he believes it will help eliminate bus overcrowding for those traveling the regular fixed route as well. As a cyclist, he’s also excited that the new sbX BRT line has interior bike racks which will make it more convenient to board and disembark. “I can’t wait!” he laughs. In 2007, Levi was awarded Honorable Mention for his work as a family and peer advocate by the County of San Bernardino. He is proud to have made a difference in the lives of so many people. LANE CLOSURE: Traffic control in effect in some areas along E Street between 10th Street and Hospitality Lane. 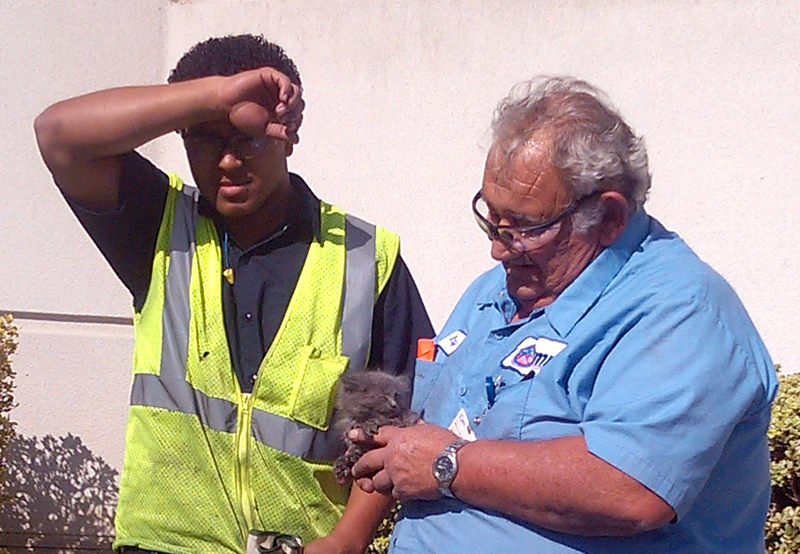 Yesterday Omnitrans building maintenance mechanics, John Palintino, Ron Freeland and Ray Ellis along with Job Corps intern, James Haynes, came to the rescue of a tiny kitten who had fallen into a sewer pipe. A customer heard the kitten’s cries when she was walking on the sidewalk on her way to her car and alerted Omnitrans Security. 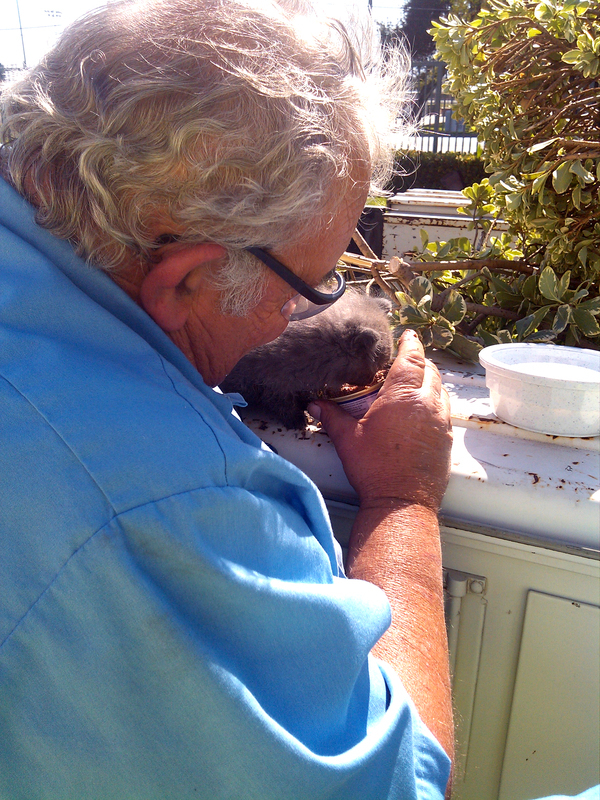 The men discovered a little grey kitten had fallen about 5 feet down a small outdoor pipe and was unable to get out. Thinking quickly, they dropped a soft thick rope down the pipe in hopes that the kitten would grab it. Unfortunately the terrified little cat only backed further into the pipe, hissing. At that point the men left the rope dangling in the hole and decided to start digging out the pipe instead. Once uncovered, they would be able to cut an opening for the kitten to climb out. A few minutes later James noticed the rope was moving slightly and realized the kitten had grabbed the other end. 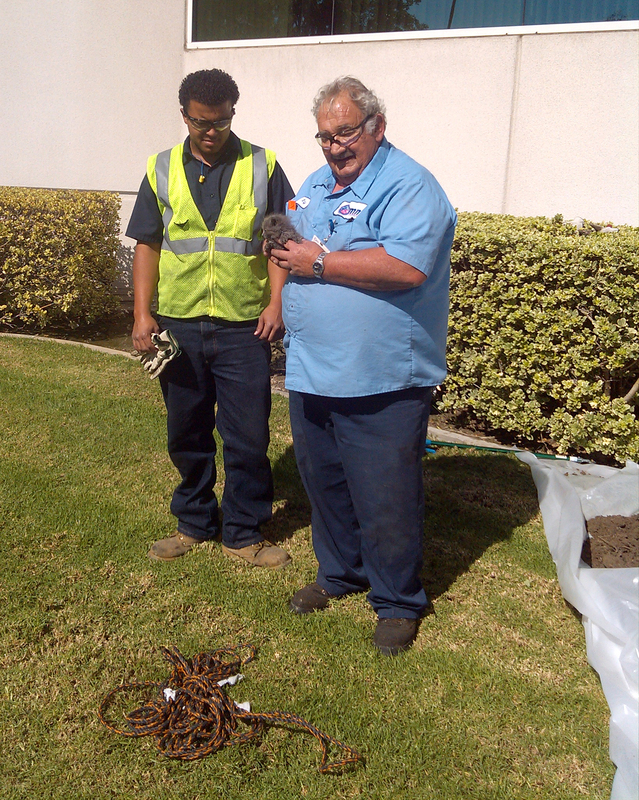 The men carefully pulled the tiny cat out to safety and gave it food and water. The kitten now has a new home with the woman who first alerted Security. And the crew has fashioned a cover for the pipe to prevent any further mishaps. Three cheers for our good Samaritan and our Omnitrans heroes! 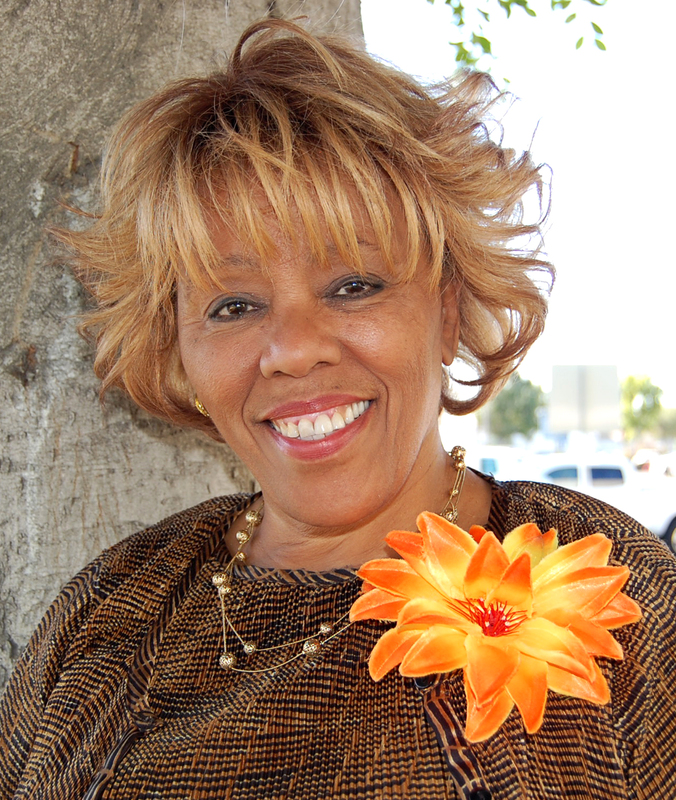 “People do not know how a simple bus pass can make a difference at the right time and on the right day,” said Helen Hunt, Director of Missions for Temple Missionary Baptist Church in San Bernardino. As Women’s Outreach Director for the Temple Community Outreach Center for more than 20 years, Ms. Helen has seen firsthand how something as basic as a bus pass can mean a life-changing opportunity to a person in need. It can help a senior citizen get to a doctor appointment so he can receive the help and treatment he needs. It ensures that a single mother can get to parenting classes that will provide her with the support and education to build a good life for her family. It provides a man who has been out of work for months with the means to make it to that all important job interview. 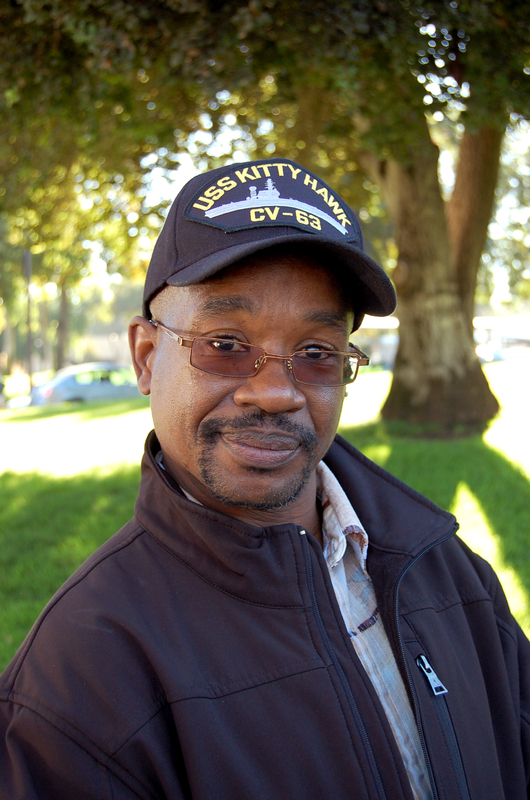 Although that $1.50 bus fare may sound insignificant to most of us, for many of the people served by the Center it’s everything in the world. The Temple Community Outreach Center primarily serves people in need within the San Bernardino , but no one is ever turned away. 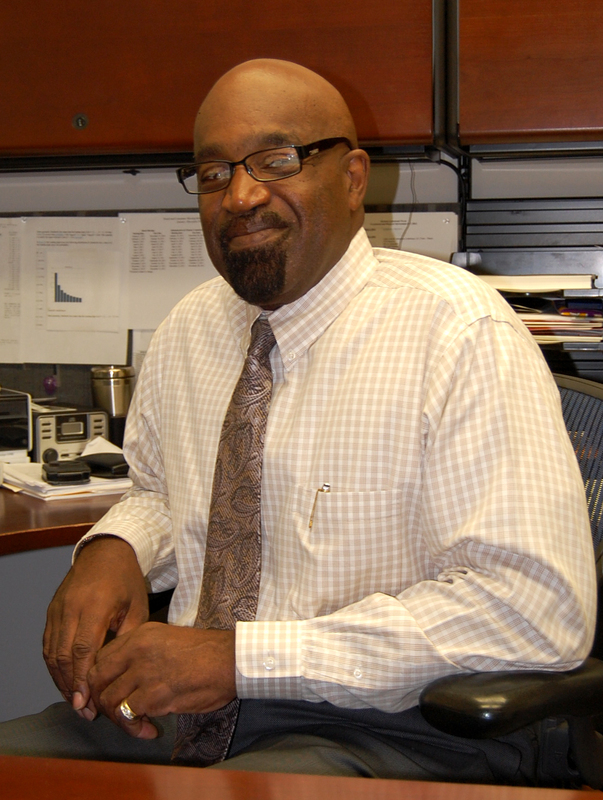 Omnitrans Director of Internal Audit Services, Dr. Samuel Gibbs, has served as a Trustee for the Center for the past four and a half years. 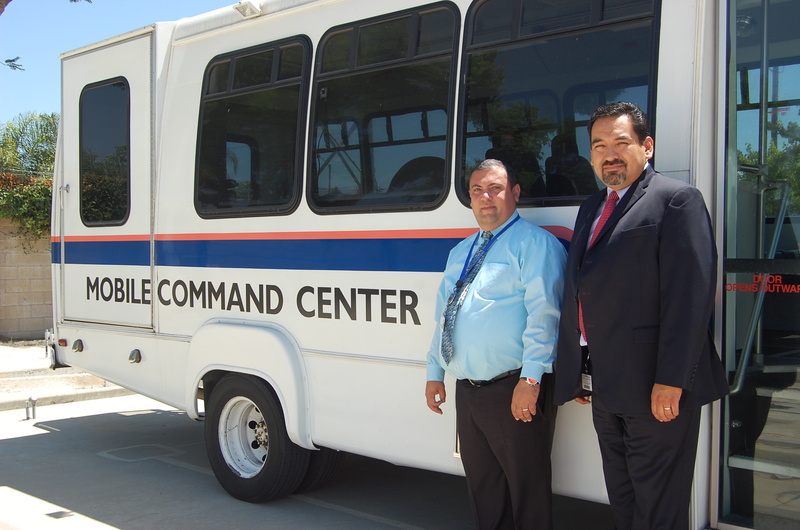 Temple Community Outreach Center is located at 1777 Baseline Road in San Bernardino. 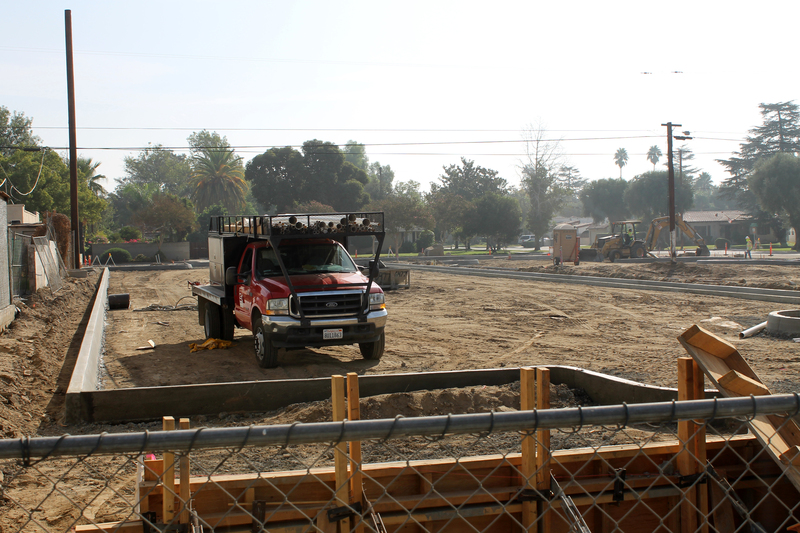 For more information about the Center and how you can help, contact Ms. Helen at 909-383-9588. This Thursday, October 18 at 10:18 a. m., the Omnitrans bus fleet will slow or stop all over San Bernardino County as a part of the Great California ShakeOut Earthquake Drill. A mock emergency announcement will be made to passengers, and if it is safe, buses will slow and pull over as they would in an actual earthquake. 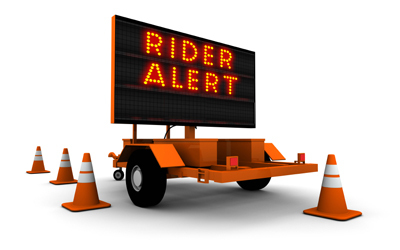 During the simulated magnitude 7.8 earthquake along the San Andreas Fault, Omnitrans coach operators will practice safety procedures that would be followed in the event of a major earthquake. Conducting a DROP, COVER and HOLD ON drill for their employees at all their facilities at 10:18 a.m. Displaying an Omnitrans Travel Training bus to instruct children on bus safety during an earthquake as a part of the ShakeOut event at the San Bernardino County Museum in Redlands. Distributing refresher awareness material to Omnitrans Coach Operators on the proper procedures to be taken if an earthquake strikes while they are on the road. Safely pull over to the side of the road, stop, and set the parking brake. Avoid overpasses, bridges, power lines, signs and other hazards. Stay inside the vehicle until the shaking is over. For more information about the Great California ShakeOut and to register your participation, visit www.ShakeOut.org/california. The San Bernardino County Fire Department, Office of Emergency Services reminds you to prepare now so you can get back to normal sooner after the next major earthquake.